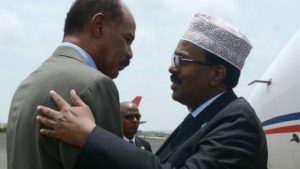 The presidents of Somalia and Eritrea on Monday signed an agreement to re-establish diplomatic ties between the two nations, surprising observers and delighting citizens of the East African nations. According to the agreement signed in Asmara by Eritrean President Isaias Afwerki and Somali counterpart Mohamed Abdullahi Mohamed, the two countries will establish diplomatic relations and exchange ambassadors. The visit by Somalia’s leader follows a stunning diplomatic thaw in recent weeks between Eritrea and Ethiopia after more than two decades. Ethiopia and Eritrea earlier this month, declared an end to two decades of conflict. The two countries have not had diplomatic ties since the border fighting between 1998 and 2000 killed more than 70,000 people. Analysts hope the peace will create a “security dividend” for the region. The leaders of Kenya and Rwanda have been effusive in their praise, while Pope Francis reportedly described the rapprochement as a “light of hope” for the continent. Somalia and Eritrea were once close, according to AFP News Agency. Under Somali dictator Siad Barre, the military regime in Mogadishu backed Eritrea’s long fight for independence from Ethiopia, which was attained in 1993. In 2006, Mogadishu accused Asmara for backing the Islamic militants fighting to overthrow the Somali government, a charge Eritrea denied. Posted by Khalid Al Mouahidi on July 31, 2018. Filed under Zoom. You can follow any responses to this entry through the RSS 2.0. Both comments and pings are currently closed.